If you follow me on Instagram, you may have seen a post about my little one off to Kindergarten this year. As you would imagine, there are lots of adjustments for us as we enter this new season. Apart from getting up earlier than normal, I have been creating easy and healthy meals that make morning routines smoother and help us get out the door on time. 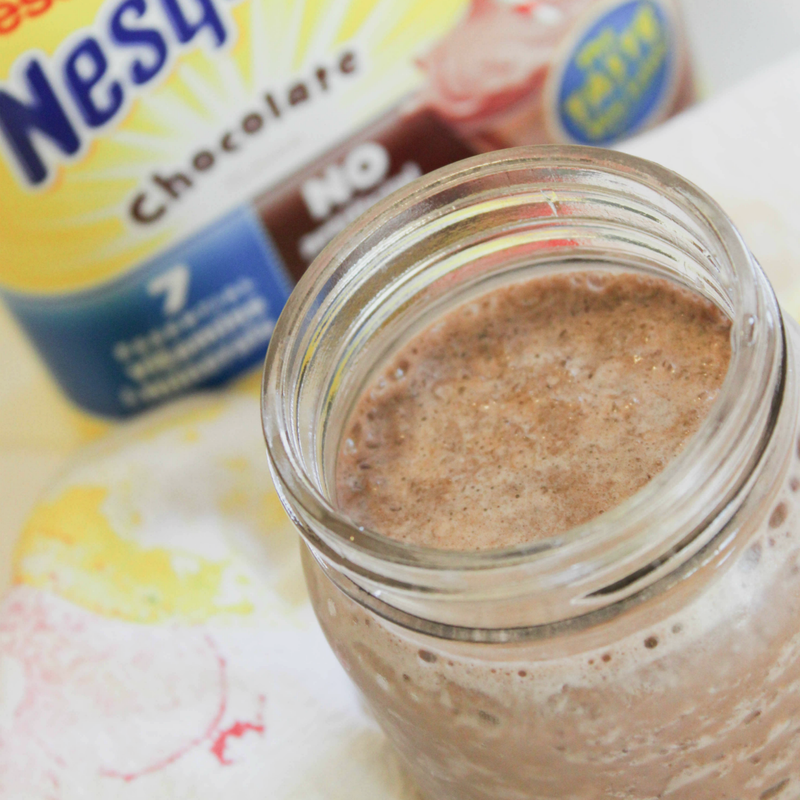 One of my newest creations is this chocolate smoothie using NESTLÉ® NESQUIK® Powder. I serve it along with breakfast or as part of an after school snack on scheduled mornings and afternoons. It is such a delicious addition to our menu. I shared our love for smoothies before and how I enjoy coming up with new ways to create them. Our 5 year old daughter is always amazed at my smoothie creations! We usually do a lot of fruit related smoothies because we enjoy all the seasonal fruit. But we are loving this new addition to our list. Adding in a banana or two provides our fruit while still allowing us to savor that delicious taste of Nesquik. Not to mention, it provides 7 essential vitamins and minerals – I’d say it is a win. We’ve been working on being more intentional about cutting out foods with all the added un-necessaries. I love when I can find foods with no artificial colors or flavors. 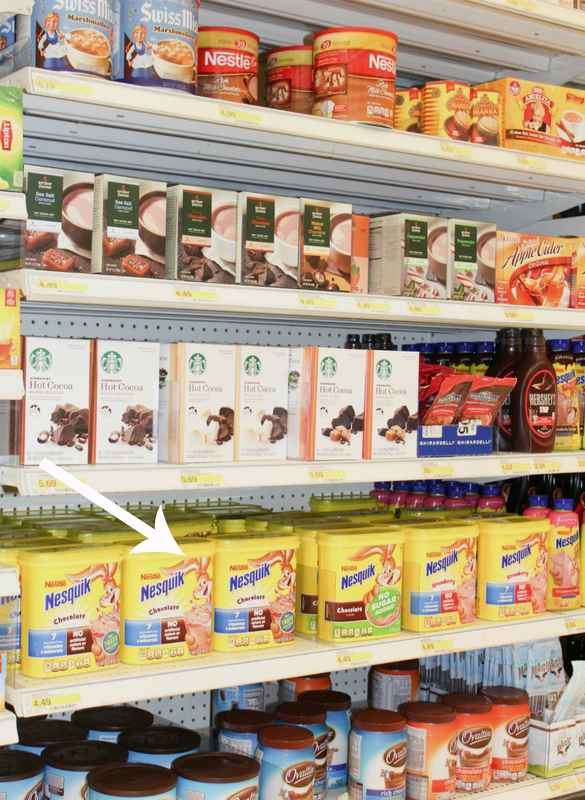 Nesquik chocolate powder is such a fun way to provide that chocolate-y taste while still providing the nutrition that our kids need since it has 45% less sugar than the leading chocolate syrup brand. This smoothie could be served both as a breakfast or after school snack for little ones. The one thing I always do when I serve smoothies for breakfast (depending on the type) is serve it along with toast, a breakfast sandwich, or some other side dish. I want to make sure that we get a complete meal and people are not hungry 10 minutes later. 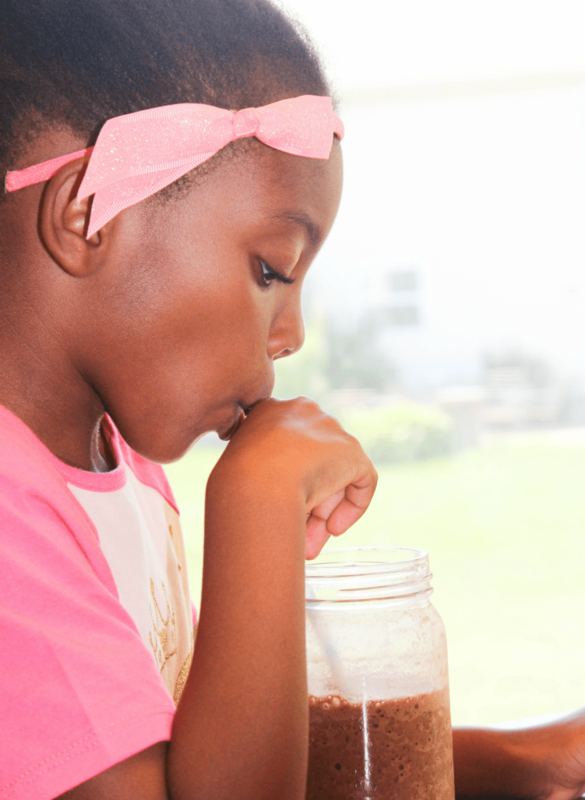 If you are in need of a quick, delicious, and nutritional breakfast addition to help jump start your kiddos day or for an after school snack, try my easy Nesquik chocolate smoothie recipe. Be sure to serve it along with additional side dishes to ensure your child gets a complete meal. Pour in two individual tall glasses and serve. Note: Use half the ingredients to for less and frozen bananas may be used in place of ice. You can find Nestle Nesquik Powder at Target and use the Cartwheel App between 8/21/2016 – 8/27/2016 to save 15% off 18.7oz Nesquik powder and 10 packs of Ready-to-Drink Bottles. Have you used Nesquik in your recipes before. 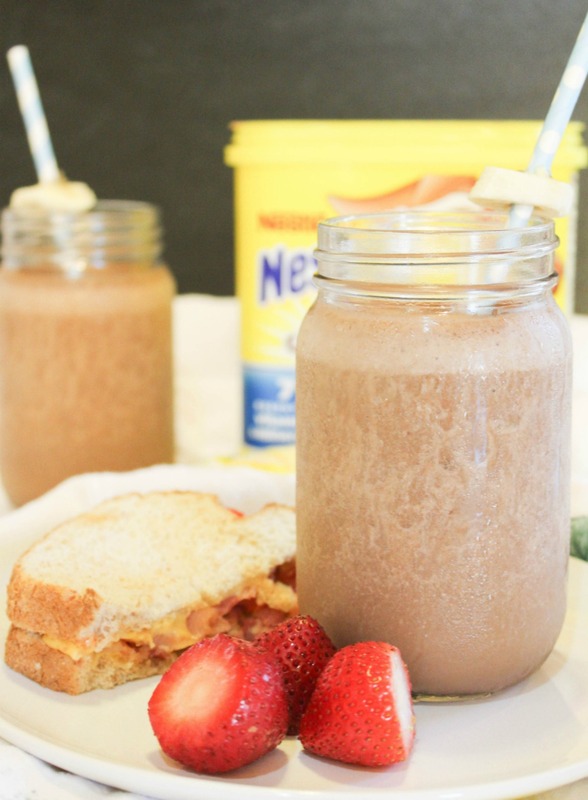 I would love to hear about your creative back to school breakfast or snack recipes using Nesquik chocolate powder. How will you use it? I always have Nesquik in my pantry for the grandkids and for me too. It’s the base of my Mocha Punch. I just had a smoothie for breakfast. I sure wish I had read this one before I made my smoothie. I’m definitely going to try this tomorrow morning. Yum! Your daughter is adorable! Always happens, doesn’t it? I know there are times you or others post a recipe and I think, “I should have seen it yesterday when I made that….” But if you try it, I hope you like it. Your grand-kids will love it, too! Zan, your daughter is so cute! Your smoothie looks so cold and delicious. I’m not sure about the chocolate and banana mixture but I’m willing to give it a try because it looks so good. I keep bananas in my freezer all the time for smoothies. Thanks Shirley! I can’t believe you have never tried chocolate and banana together:) Hey it is a good combo! Nesquick is loved at our house. I’ve never tried it in a smoothie. You are always thinking outside the box. Have a great sxhool year. LOL… Yep, sometimes you have to think outside the box! It really tastes great in a smoothie! Try it! You are so talented with snacks and drinks! This looks so tasty, and I know my son would be crazy for it. Plus, I could include some fruit, too. Thank you Lora. It is very tasty and I think your son will enjoy it.